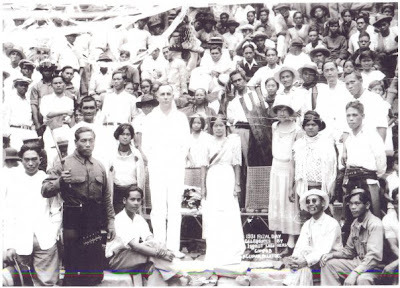 "1931 Rizal Day with Igorot Laborers Camp 3 balatoc mines. " In the picture is Guy Montague, the resident manager of the the Balatoc gold mine in Balatoc Mines from 1924-1935. His wife, Kate is also in the picture. "From 1930 to 1935 Kate Bigelow Montague lived in the moutain provice of of northern Luzon where her husband was resident manager of the Balatoc Mines near Baguio. During that time she journeyed deep into the Igorot vilages attending their weddings, their burials and their many festivals. Her love for these people grew and after spending a year in study in Manila in 1937, she knew that one day she would write about them. "Send the Wise Wind" is that book, her first novel." Where is that novel now...?